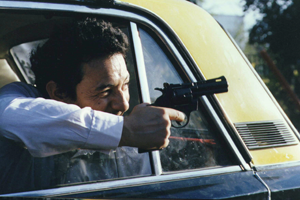 This black comedy tells the story of Ulises, a taxi driver who thinks that joining the gang of thieves that holds him up may be the way out of his problems. The lure of easy money throws him off his usual driving route. His assailants lead him to rich neighborhoods, where the cash that will help pay off his beat-up taxicab can be found. After numerous failed robberies and overwhelmed by a police chase, the inept thieves end up trapped in Ulises’ home, intruding upon him and Javiera, his beloved daughter. This is too much for the cab driver, who resolves to end the partnership in a drastic way. 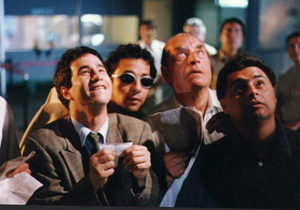 Taxi para tres was nominated for a Silver Ariel for best Latin American Film, and for a Goya for Best Spanish Language Foreign Film. Since 1972, Orlando Lübbert has been writing and directing documentaries as well as narrative features. After the military coup in Chile, he lived in exile in Mexico and Germany where he worked as a professor. After his prolonged stay in Berlin, he went back to Chile in 1995 to begin making various documentaries, including Chile, donde comienza el dolor and Isabel Allende. Currently, he is the director of the film school at the Universidad de Chile.